I am very privileged to take part in Samantha Redstreake Geary’s Composers for Relief: Supporting the Philippines musician/writer collaboration. 28 tracks from gifted composers and stories written by talented authors to accompany each track to produce an album and accompanying eBook. All proceeds go to Gawad Kalinga to support the victims of the Philippines’ worst Super Typhoon Yolanda (Haiyan). I chose to write to a gorgeous track called ‘Fighting Back’ by Dreammaker. Our theme is ‘hope’ and that’s exactly what this track gives me! Aiden stood poised above Eloise, nerves tingling and iron bar in hand. He scanned every dark corner of the dingy scrapyard for danger as she caressed the delicate shell beneath her fingers, softly murmuring spells of protection that he dared not disturb. She smoothed her hands across the silver and white streaked egg, and he desperately fought the urge to touch her alabaster skin. Far off tyres squealed, engines screamed, and Aiden flinched. He instinctively reached out and grabbed her hand, recoiling as hot white flickers burned his fingers. The iron bar clanked to the ground. As pain surged through his scalded fingers he met her eyes with alarm. “We have to go!” he hissed, and she hurriedly placed the egg in her small leather satchel. White sun blazed, glinting and blinding against the warped scrap metal piled high in the yard, and Aiden revved the silver Bandit. He tensed as Eloise wrapped her arms around his waist, and her bare cheek, against his leather jacket, sent heat radiating and pulsing through his shoulder. They burst through the gate pursued by huge bellowing bikes, belching black smog. Fear clutched Aiden’s heart as he twisted the throttle speeding through back alleys, flanked by uniform grey tenement buildings and gunmetal lampposts. Eloise tightened her grip. “Hurry!” she cried. He glanced in the mirror, Eloise’s pale hair streamed wildly behind and the black Triumphs droned, bearing down. Aiden felt her heart beat, fast and uncontrolled, through his heavy leathers as they roared out onto the highway. He swiftly wrenched the bike off road and down through trees on a loose gravel track. Ashen trunks towered and their colourless, paper-thin leaves fluttered beneath a grey, cloud daubed sky. Eloise’s dove-grey skirts wrapped tight around her legs as her knees gripped, and her black coat flapped at her hips. Aiden’s heart hammered against his ribs as they bolted through the monochrome terrain. The bike disturbed a horde of shrieking birds and Eloise screamed. Aiden fought to retain control of the Bandit as birds burst into flight, flapping wildly before him. He swerved into a thicket of narrow chalky trunks and dappled grey foliage, struggling to remain upright. The bike wobbled and Eloise grasped her faded leather satchel to her chest as he skidded, and the bike careered across the blackened grass. Eloise’s scream echoed throughout Aiden’s head as the bike spun out and they were hurled from the smouldering, throbbing machine. Aiden rolled and sprang to his feet as rumbling motorbikes rose over the brow of the hill charging towards them. Eloise was already on her feet, her bag still clasped to her chest. “Stay with me!” Aiden yelled running alongside her. She caught his eye and stumbled, crying out as a latch on her satchel tore open. The precious egg shot out of her bag. It flew and bounced on gravel and grit, and Eloise flinched as it hit the ground. “No!” she cried. A dull thud, as dull as the pallid landscape, rang out as it bounced and fractured. The menacing, pursuing bikes created an alarming crescendo close by as the marbled white and silver egg rolled and came to a halt. The egg began to ooze and Eloise fell to her knees and wept. A dazzling brilliant flash burst from the egg, and as their hands fell from their faces they stared in astonishment as vibrant swirls coiled like steam from the splintered egg. The shell shattered and a bird of fire rose from its fragments. She nodded vigorously as the bird rose within a mixture of vibrant shades never before seen. The bird’s glorious plumage lit up the forest, and suddenly the grey earth turned to shades Aiden did not recognise and the silver trunks became dark. Aiden’s mouth dropped as foliage suddenly matched Eloise’s glowing eyes, and he grinned as his leathers turned the new shade of dark fire. “What is this?” he asked in wonder as the bleached landscape warmed as the bird hovered before them. Vivid colour seeped out of the egg, staining the ground, and as the bird flapped its resplendent wings, colour exploded into the grey and colourless world. The bird trilled and fluttered, spiralling up and into the now very blue sky. The grey men on bikes, their mission doomed, hurriedly dispersed, colour chasing their exhaust plumes as the phoenix rose. 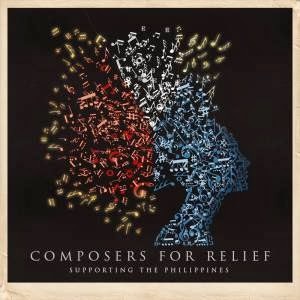 Composers for Relief: Supporting the Philippines is available on iTunes and Amazon. This entry was posted in Fiction, Music/Writing Collaborations and tagged Colour, Composers for Relief: Supporting the Phillipines, Dreammaker, Fighting Back, Gawad Kalinga, hope, phoenix, protection, Ryo Ishido on 24th December 2013 by Lisa Shambrook.